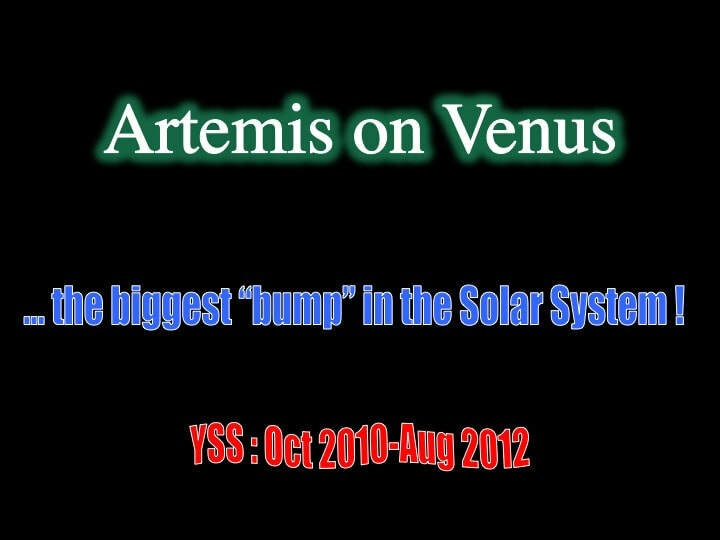 Biggest "bump" in the Solar System ! Listening to planetary geologists, you sometimes get the impression that there's a bit of a competition going on to find the biggest "whatever" in the Solar System. Mars leads the pack for the largest mountain (volcano really) and the largest valley, and Jupiter's ice moon Callisto and our own Moon compete with each other for the biggest impact feature. Now in a recent paper in the scientific magazine "Geology", scientists think they've discovered the largest geological "bump" in the Solar System. The very obvious circular feature in the venusian southern hemisphere - Artemis - was identified in the first Magellan images. Geologists have been arguing about how Artemis formed ever since its discovery - but the recent paper in "Geology" magazine suggests that it's really just a pimple on a much larger geological feature, and if correct, this would dramatically narrow the options as to its origin. So let's take a look at the evidence in favour of what we can loosely call a "Greater Artemis", and what it tells us about venusian geological evolution. Remember that Venus has been completely resurfaced by planet-wide volcanic eruptions during the past billion years - and some say that such volcanism may be continuing to this day. So - by the standards of our 4.5 billion year old Solar System - the geological features of Greater Artemis that we'll look at here are relatively young. This is about as "natural" a view of Venus as one can get. Radar can penetrate the cloud cover and "see" topography in good detail. The white features are areas of very strong radar reflection, due to a surface coating of Fool's Gold - more technically known as iron sulphide (pyrite : FeS2). Notice how this forms an E-W band, with large dense patches to the West and squiggly strands to the East, and a very obvious circular feature in about the middle. This circular feature is Artemis - and to put it in perspective, it's about 2100 km across. This false colour image of Venus picks out rough differences in geology : tan and white are quite distinct from blue and green. If you get your bearings on the circular feature - Artemis - then we can see that there are two large patches of tan and white to the North and West. Keep these in mind, as we'll come back to them throughout the presentation. Here's a different false colour image of Venus, this time picking out rough differences in topography. Yellowish colours are high ground, and greenish colours are generally low ground. The circular feature - Artemis - lies on the south side of a band of relatively high ground, with the two patches to the North and West that we saw on the previous slide, and a third patch of high ground linked to the first two by some squiggly looking strands of "something". If we now put this all together on a radar image we can see that the circular feature - Artemis - is part of a larger highland region known as Aphrodite Terra, where "Terra" here simply means "ground". Aphrodite Terra is made up of Ovda, Thetis and Atla Regio, where "Regio" means highland. Ovda and Thetis are neighbours, and Atla is linked to them by a complex of sinuous rift valleys referred to as the Diana and Dali Chasmata (chasms). Remember, Artemis is over 2000 km across - so how big do you think Aphrodite Terra is ? Here's a more photographic close-up of Artemis. These round Corona features are characteristic of Venus, but this is by far the largest and the most spectacular. The moat-like feature that surrounds it is a circular valley ~100 km across by 1-2 km deep. There are lots of theories as to how it might have formed, ranging from an impact feature to the product of magma welling up from deep inside the planet. Some geologists have even suggested it formed by plate-tectonic-like processes, but this doesn't stand up very well to scrutiny. However, all of these hypotheses are hampered by the fact that such Corona features do not occur on Earth. They are unique to Venus, so they're difficult to test, even by simple comparison with knowledge of our own planet. Oh, there are round structures on Earth bounded by circular depressions, but nothing quite like this - and certainly not formed at the surface as this was. As already mentioned, if Artemis is really part of something much bigger - geologically speaking - then this would have repercussions for theories of its origins. So let's now pull back, and look at the really big picture of this part of Venus. The paper in "Geology" magazine proposes that everything we've looked at so far is, in fact, part of an even larger geological feature that we can refer colloquially to as "Greater Artemis". The white circle indicates the approximate outer limit, about 13,000 km across. You can see that this coincides with the approximate outer limits of a set of concentric red lines, referred to as wrinkle ridges. What are they ? Let's look at some examples from north of Ovda Regio. A geologist will immediately recognise these hairpin bends in geological layering as folding. Folding of a layer implies that the layer was shortened more or less perpendicular to the trace of the fold. However, not all folding on Venus is as easy to identify and decipher. When the shortening gets locally intense, the hairpin bends disappear and are squished into what look like simple stripes. However, to a structural geologist (me ! ), they likely represent very tight folding of volcanic layers close to the venusian surface. In addition to the concentric folds, you can clearly see a set of radial lines, spanning a circular area 12,000 km in diameter, that all seem to point inwards to what we would now call the relatively small Artemis Corona structure. Again, a geologist would immediately recognise these as a giant swarm of radial dykes - a feature that is not uncommon on Earth, but is rarely this big ! So what is a dyke swarm, and what does it imply ? Dyke swarms are swarms of cracks in a planet's crust that fill with molten magma under enormous pressure that is trying to rise to the planetary surface. Some terrestrial examples are shown on the right hand side here. The block diagram on the left indicates that such swarms usually indicate that the planetary crust has been extended to accommodate the injection of the liquid magma, the complete opposite to the shortening implied by the concentric folds. Now look at the main band of highlands from Ovda Regio to Atla Regio. Note the speckled pattern drawn E-W through the core of this region, which includes the rifts of the Diana & Dali Chasmata system. Here's a photographic close-up of the Chasmata system ~7,400 km long. Note Artemis Corona to get your bearings. Notice how intricate the Chasmata system is. Each of these radar-bright strands is a rift valley, and rifts - as in our own Ottawa Valley - indicate extension of the planetary crust at a high angle to the valley trend. Now let's go back to the big picture, and put these rifts into context. See how the speckled band cuts right across Ovda and Thetis Regio. However, when we get to Atla Regio something quite remarkable happens : the speckled band splits into three branches that join together at the centre of the Atla Regio highland. Geologists instantly recognise that as what they refer to as a "triple-junction" that forms as the planetary crust is stretched and split above a rising dome, itself 1000s of km across. In other words, in the case of Atla Regio the rifting represented by the speckled pattern here is related to the formation of the highland as a dome, while in the case of Ovda and Thetis Regio the rifting seems to ignore the shape of the highlands and cuts right across them. In other words, the rifting is younger than the older Ovda and Thetis highlands. We now have the outline of a geological story that evolves through time. According to the authors of the Geology​ paper, the Greater Artemis feature appears to be a giant dome in the venusian crust that formed above a giant plume of hot material that rose from deep within the planetary interior. As it did so, smaller domes began to form above the plume in the early part of the story, giving rise to Ovda and Thetis Regio. As the rising plume grew, a progressively larger volume of venusian crust was induced to form a dome above the plume. As the dome grew, so the outer crust of the dome began to stretch and break to form a giant radial dyke swarm centred about a smaller dome that we now see as Artemis Corona, which began to develop at this time. At the same time, around the periphery of the giant dome, the planetary crust began to buckle and form concentric folds that - as they became progressively tighter - were transformed into stripes, referred to as wrinkle ridges. Eventually the top of the dome rose so much that it split along an E-W axis, except in the East, where it formed a triple junction over a new, younger dome that we now see as Atla Regio, one of the youngest features in the evolving "Greater Artemis" structure. Finally, what do we know about what caused the "Greater Artemis" feature to form in the first place ? Frankly not much, however there is some speculation that the trigger could have been a major impact that catalysed the upwelling within the planetary interior - but we'll have to wait and see if that has any legs ! What we do know is that there's nothing like it anywhere else in the Solar System !